Hamas Rocket Attacks on Israel. During the three weeks of Israel's operation against Hamas, 1,202 trucks carrying over 29,000 tons of humanitarian aid supplies have entered the Gaza Strip through Israel. Since Israel’s Operation Cast Lead against Hamas began on Saturday, December 27 in response to three years of rocket attacks on Israel’s southern towns, Israel has been doing everything in its power to aid the Palestinian civilians residing in Gaza. The Israeli government has made it overly clear that it does not wish to harm innocent civilians and that it will continue to help them for the duration of the operation. In preparation for the coming operation, The Israeli government sent 90 trucks worth of humanitarian aid goods into Gaza on Friday, December 26. 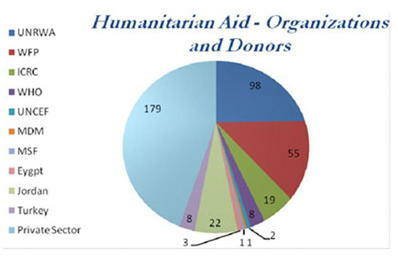 Israel has been working around the clock with international and private aid organizations to ensure that the Palestinian civilians in Gaza are receving the food and medical supplies that they need. On December 29 alone, Israel sent 63 trucks (1,545 tons) of humanitarian aid goods into the Gaza Strip including rice, yeast, flour, sugar and 64 tons of medical supplies. On December 31, 98 trucks and 2,366 tons of food and supplies were delivered in Gaza. On January 5, 80 trucks delivered goods to the area. On January 6, 49 trucks were sent into Gaza by means of the humanitarian unit of the IDF. 100 trucks and 500,000 liters of diesel fuel were sent in through the Kerem Shalom crossing on January 7. Additionally, hundreds of thousands of liters of diesel fuel were pumped into Gaza on January 6 including fuel for the Gaza power station, UN facilities and domestic cooking fuel. On Monday, January 12, Israeli security forces at the Kerem Shalom crossing caught a truck trying to smuggle electronic equipment into Gaza including infra-red cameras and computers. Electric equipment is not considered part of humanitarian aid although Israel has allowed certain electronics into Gaza in order to correct the city's electricity grid. As of January 15, Gaza's power grid was at 74% working capacity, up from 40% at the beginning of the operation. On January 14 an El Al jumbo plane filled with 100 tons of medical and food supplies from UNICEF landed at Ben Gurion airport. On Thursday, January 15, 170 trucks of humanitarian aid as well as 195,000 liters of fuel were sent into the area and on January 16, 135 truckloads were delivered. On these days combined, 3,790 tons of supplies were sent into Gaza. So many truckloads of aid have been sent in, in fact, that the World Food Programme took a two day recess from its food donations. The organization resumed its deliveries on Tuesday, January 6. The Gaza food warehouses are filled to capacity and are capable of lasting the citizens two weeks. Despite many reports that Gaza’s citizens are getting enough aid from international sources, some UN officials claim that extreme food and medical supply shortages remain. The United Nations would like to blame Israel for the crisis but, yet again, the blame falls with Hamas. On January 6 it was discovered that Hamas gunmen had opened their own hospital and were stealing a significant portion of medical supplies from the trucks that deliver humanitarian aid daily into Gaza. The medicine, of course, is intended for civilian hospitals and emergency medical care. By doing this Hamas is, yet again, denying its own civilian population the supplies that it desperately needs. Similarly, Hamas gunmen are hiding themselves in civilian hospitals, particularly among the various maternity wards, attempting to find refuge from Israeli fire. This is just one more example showing that Hamas truly takes its people’s safety for granted. Although Israeli officials realize that Hamas is preventing aid supplies from reaching its intended point of delivery, on January 7 Israel began a “humanitarian recess” in which the IDF and IAF would stop its operation for three hours daily so that Gaza’s citizens could safely go into the streets to collect food and medical goods. Hamas gunmen were the first on January 7 to end the temporary ceasefire, firing dozens of rockets at Israel’s southern towns. The Israeli-enforced humanitarian corridors have continued each day as scheduled despite Hamas's refusal to cease rocket fire on the western Negev during the three-hour ceasefire. On January 15, Israel decided to lengthen its daily humanitarian recess to four hours instead of three in order to allow more Gazans to get the supplies that they need. The decision to increase the time span of the pause came from Israel Joint Humanitarian Coordination Center (JHCC). The Israeli government is also allowing Palestinians from Gaza to enter Israel for medical treatment. Dozens of wounded and sick Gazans have already been transported into Israel through the Erez Crossing and are now being treated at various Israeli hospitals. Israel is encouraging more medical transfers but the Palestinian Authority is refusing to pay for the medical care because it feels Hamas is responsible for the injuries in Gaza. Israel and the Red Cross have agreed that Israeli hospitals will absorb and treat for wounded Gazan civilians after the operation is over. Meanwhile, Magen David Adom, Israel’s emergency ambulatory service, has been put on high alert and is operating 600 ambulances in Gaza to help any wounded or sick in the area. On January 12, the Israeli government released official plans to build a field hospital inside the Gaza Strip to be run by the IDF Medical Corps in order to aid any Palestinian civilians wounded from the daily operations. On Sunday, January 11, the Israel Defense Forces set up a humanitarian aid center in Tel Aviv in which officials from aid organizations can come to arrage supply transfers into Gaza. IDF officials, and representative from the UNRWA and ICRC met on Sunday to reopen and reestablish rules of aid transfers which the UN had withheld for several days due to an accidental death of one of its truck drivers. On January 15, Maj. Gen. Yoav Galant, head of the southern command, ordered that a special team be created in the south specifically to assist civilians in Gaza and to help them rebuild their lives in the area. The team will be made up of IDF troops and medical personnel as well as other administrative and logistical members. Israel has made it clear that this operation is against Hamas armed forces and terrorist cells - not Palestinian civilians. The Israel Defense Forces is doing everything in their power to minimize the number of civilian casualties. The IDF has gone so far as to call apartment complexes in the Gaza Strip that are known to house Hamas forces and warn the civilian residents of coming airstrikes, allowing them enough time to evacuate the buildings. These warnings are given despite the fact that they tip off Hamas operatives. While the Arab world might like to deny it, the Israel Defense Forces are conducting their operation in as humane a way as possible by both limiting civilian casualties and offering an extreme humanitarian aid effort in Gaza. Hamas, on the other hand, denies its own people aid and infringes on their security. As of January 18, 2009, Israel declared a unilateral ceasefire and began to move its troops out of the Gaza Strip. 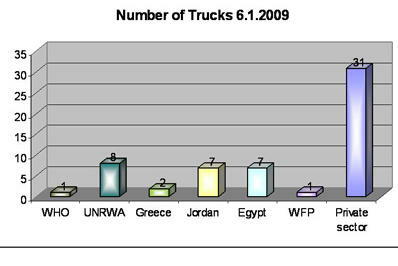 Since then, aid trucks continue to cross into Gaza from Israel. Hamas was accused of hijacking aid trucks and selling its goods during Israel's operation. Directly following the ceasefire Hamas and Fatah leaders began to blame each other for food and medical shortages in the Strip. Hamas accused Fatah of stealing aid from trucks in order to sell goods on the black market as well as detaining trucks along the Rafah border so as to prevent Hamas from restrengthening itself in the area. 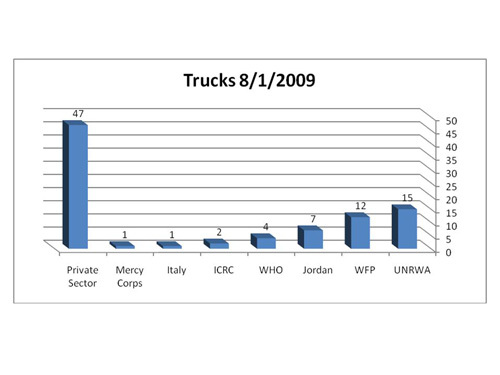 On January 19, Jordanian sources confirmed that Hamas gunmen hijacked 12 trucks on their way to UNRWA headquarters. Tensions continued to rise as Hamas and Fatah both pled with the international community not to give money to the other organization. Hamas does not want to give Mahmoud Abbas more power and the PA wishes to retain Hamas's weakened state. The organizations are fighting for control of Gaza including the authority to rebuild the area's infrastructure. Meanwhile, the medical clinic that Israel opened along the Erez border on January 18 remains empty. The treatment center is meant to assist 50 Palestinians at a time for wounds or other non-operation related illnesses. As of January 20, only seven Palestinian children came to the clinic for cancer treatments. The treatment center is stocked full with doctors and medical supplies as well as four ambulances but the Gazans are too afraid of Hamas forces to set foot inside or contact the Israeli-sponsored clinic. Doing so would be considered treason and Hamas operatives have been rapidly executing any Palestinian in Gaza who cooperates with Israel.